-Baie d'Argosier which is some Sea Buckthorn that i've never heard of..
How was the 50N, 4E? Have a couple of bottles I bought when I went to Brussels, still haven't tried it though. I'm currently in Munich, so drinking a lot of weissbier. I think i've tried them all now, and Schneider Weisse remains my favorite. 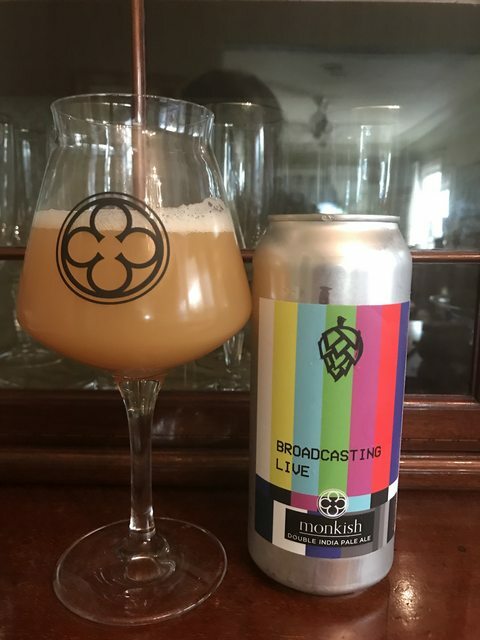 Monkish Brewing Co. Broadcasting Live. DIPA.8.5% ABV 100% Nelson Sauvin hopped. You all know I'm a Nelson whore, my favorite hoppy beer ever being the OG Alpine Beer Co. Nelson. Monkish dropped this recipe a couple months ago for tap/growler only. Ten days ago they released it in cans. I had one on day one for scientific purposes, it was amazing, but I wanted to let it chill out a week or so before I checked back in. The first thing that wallops you is the aromatics, I am comfortable saying the nose on BL is even more pungent and aromatic than the OG Alpine Nelson, no kidding. The flavor profile shows earthy green herbaceous notes up front before transitioning to sweet cantaloupe melon, papaya,that white wine must note, mandarine orange and stone fruits, absolutely incredible complexities. The mouth is soft and full but has enough carbonation to carry all these layers of flavors. It finishes long and bone dry. This is without a doubt IMO,and in part because I love everything Nelson, the best Nelson Sauvin beer I have ever had, and because of that, also IMHO, the best Monkish beer they have ever brewed. If you can trade for it, seek it out, it's worth it. did you use a straw? It was amazing. The acidity is smoothed out by the flavors of the Armagnac barrels. Delish. Is yours the cognac or Armagnac barrel version! Either way I’m sure it’s killer. Where did u get it in Brussels?! I’ve never seen this for sale retail. It's the cognac version. Bought it at Cantillon. Also picked up some of the regular gueuze, lou pepe, fou foune and kriek. Nice! Yah I got fou there but never seen 50N. 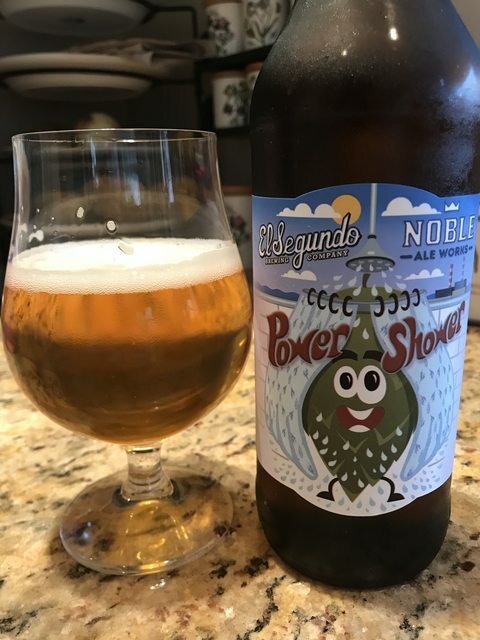 Noble Ale Works / El Segundo Brewing Co. Power Shower DIPA. 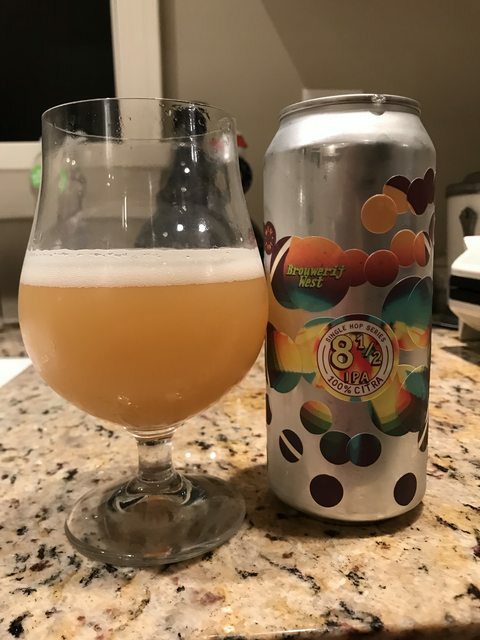 8.8 ABV. No hop bill listed. A fantastic collaboration. Pure west coast hoppiness. Loads of juicy citrus, stone and tropical fruit notes and a great wallop of bitter pine resin mid palate.Bone dry finish. A massive hoppy punch to your grill piece, and quite honestly, one I've been looking forward to for a long time. Oh, and it's clear ! I had that one the other night, Bud, on draft, and thought it excellent. Glad to see it's in bottle, too! Brian, you were asking about if our Rauch Helles will make it to California. I'm sending them 6 kegs of it this week. We will definitely be making it again, since it's been very popular. We had a Shelton Bros. beer thing at the local Tap Room. While Cantiilon and other Belgians were on tap, I went with the Mahrsbrau Ungespundet lager, which was as delicious in McMinnville as it was a month ago in Bamberg. Very cool, Rick. Thank you. Is there someone I can contact to find out exactly where they'll be landing? Our distributor is Lime Ventures. They handle a lot of Belgians and a number of smaller American breweries. Probably the best way to get a keg where you want, would be to have the establishment contact them. Thanks, Rick. I'll see what Naja's tells me. Brouwerij West. 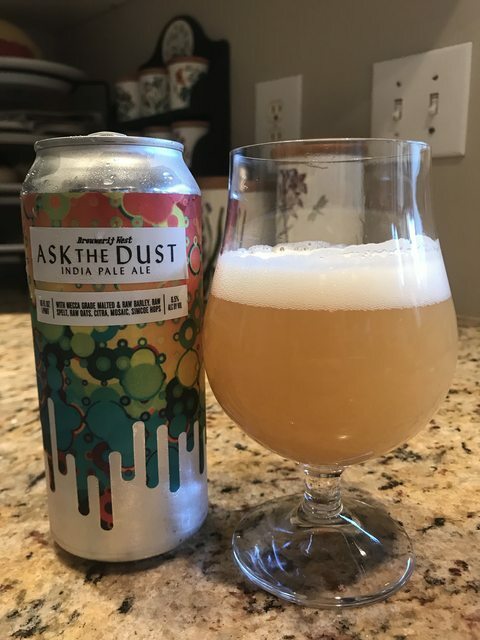 Ask The Dust IPA 6.5% ABV. Hopped with Mosaic Citra and Simcoe hops. The new batch, for Brian Grafstrom, how can they possibly make this better ? This new batch is incredible, hit up the brewery on Saturday mainly to to pick up the new 8 1/2, this time with Citra which is stupid good, I'll post a review on that one soon. Anyway I'm sure you've sniffed this one out already ? Winter ales are appearing now in Oregon. Just had two so far, and neither did much for me. The most surprising Pfriem's Belgian Christmas Ale. Last years was amazing and disappeared off the shelves in a flash. This year's a total meh. Totally atypical for Pfriem. Hey Bud! When did they can that one? I saw some at WF about a month ago, or so, but not since. Court brings me to Long Beach tomorrow morning, so perhaps I should swing by the brewery when I'm done, assuming not too early. Thanks for posting! and I guess I should try this 8 1/2 of which you speak, too, huh? Brouwerij West 8 1/2. IPA 6.5 % ABV. 100% Citra hopped. The latest in their single hop series focuses on one of my favorite hops. Pours a beautiful milky white light orange color with a nice inch of rocky foam. Opens with aromatics of everything orange, sweet candied mandarine orange, sweet tangerine's and navels. Flavor's follow the nose until mid-palate when this transitions to sweet ripe melons and stone fruits. This has a medium soft body with good carbonation to clean the palate, a real crusher @ 6.5 %. As good as any 100% Citra IPA I've had in recent memory. Oh, and that can art ! Sour Rose with Cabernet Franc? Yes. That sounds very interesting Jerome. Just considered an offer to buy Founders Canadian Breakfast Stout, $24.99, but passed. With Perennial's Abraxas hitting markets here this week, and perhaps the coffee variants with some scouting, I prefer that to the Founders stout offerings at the same price, and sometimes less. Also a bit put off by the maple syrup thing. Side Project stouts are also local and amazing, though they can be pricey or on-site only. I've been enjoying Decadent IPAs recently, as mentioned in another thread. Had a Prairie Birthday Bomb this week, a really big stout but hides its 15% alcohol well. Also had an Achel with last year's date that was quite good the other night. Michael, have you ever had the Founders CBS? If "No," then you **really** should buy it. I never would have guessed the inclusion of the syrup if I had tasted it blind. The beer does not come across as sweet. I prefer it to the KBS, which I feel is overrated, but nonetheless excellent. It was actually delicious. High acid and try finish with a little bit of earthiness. I'm not a huge fan of the big stouts and imperial stouts. I may have overloaded at first from the KBS, CBS, Goose Island, EvilTwin jesus more jesus and all the other Jesus's. I basically stick to 3 stouts. The brooklyn chocolate stout, westbrook mexican chocolate cake, and goose island. Great with cigars. I've never had it. My reluctance was from being underwhelmed by the KBS and even the regular breakfast stout. Also, there's just a lot of good stouts available locally and it makes this kind of wide (well, national anyway) release seem a bit meh. That said, I appreciate your advice and if I can work back by the store maybe I'll grab a bottle. If I do I'll let you know my opinion. I like big stouts in colder weather. My favorites are all locals though. Perennial's Abraxas and all of the variants I've tried are great. The coffee and particularly the Barrel Aged are great but very hard to get. But my ultimate favorites are from Side Project and are usually on-site only. They do a Three Candles or a Five Candles that are aged in used Four Roses barrels for three or five years respectively and are really to me as good as I can imagine a stout getting. They're huge, and a small glass will do. For something more widely available I like the Prairie Bomb and variants, especially since they come in 12 oz. bottles and can be had for about $6-7, making them seem far more accessible than the high priced, 750 ml offerings that are the norm in this category. Oh, and Boulevard used to make an Imperial Russian Stout that was really good too. They may still, I'm not sure. If I see any of those you mention I'll give it a try. By Goose Island I assume you mean the Bourbon County? If so I find those okay but a bit hot. @Michael - barrel-aged Abraxas is impossible to find out here, so well played. I usually pick up a bottle or two of the regular Abraxas, as well as the Sump, which I prefer. There are a TON of Prairie Bomb! variants, but I've thought they were a bit overpriced. Fremont Barrel-Aged DS (formerly KDS), Deschutes Abyss and Alesmith Speedway (now in cans!) are all hitting the shelves. I believe Fifty Fifty Eclipse should be coming out in December, which is one of the OGs of the category (with Abyss). * Firestone Walker: Parabola (Parabajava variant is awesome, as well, but I've only found at the brewery). Velvet Merkin is ok, but nowhere near as good. * Epic Big Bad Baptist: super reasonably priced for the quality. Haven't seen it yet on shelves, but it's usually $9.99. They also do some great experimental hops stuff on the IPA side. * Pelican: Perfect Storm. Aged barley wine (I know, dif thread), but this one is one of the better ones. Avoid the rest of the Pelican line-up if you see it. I know it's an Imperial Porter, not a stout, but I think Ballast Point's "Victory at Sea" is pretty damn good, and it's very affordable for the style. Another big fan of Alesmith's "Speedway Stout". hmmmmm ... both of those have coffee in them ... I should look more into coffee stouts, I suppose. I actually have a weird thing about coffee stouts. When they’re done properly I think they’re excellent. However often I find a lot of bitterness, and a flavor the reminds me of coffee grounds. I’m also very picky about coffee, so it could just be that I have an issue with the quality of the beans, or it could come from overextraction. I do think the best examples can be some of the best stouts. I know I keep harping on side project but they really do a good job. One of the things they do with there “shared” line is a range of stouts called coffee shop vibes, each of which uses a different single origin coffee from local roasters. Excellent stuff, and I’ll be damned if you can’t actually taste the variation from the beans. I guess what I’m saying is that I think it takes a deft hand to properly handle coffee in stouts. Andrew, I’m surprised to see you mentioned that Prairie is expensive. We typically only see a couple of the variants, but there never more than seven dollars for a 12 ounce bottle, which is an excellent price in my opinion for a stout like that. Most of the other beers you mention I’ve never seen in my market. Same for some of those that you mention Brian. However the beers and breweries available here are constantly expanding, and I’ll keep my eyes peeled. Oh, and I should add that the barrel aged Abraxas is very hard to get here as well. Great stuff if you could be found though. I usually see them at $10-$13, in the same range (and size) as the Avery Tweak bottles. Just finished a Rogue 30th Anniversay “wheat wine.” Went great with pizza, albeit at 10.1% Not bad. Andrew that's crazy, literally half that price here. I'm a semi-regular buyer at $6-7, finding not much in the "serious stout" category that inexpensive. At twice the price I'd be less thrilled. I'm not usually into the wheat and barley wines. Too often the alcohol sticks out and/or they can be really sweet. We get "some" sump but it's not the easiest either. Being local though you sometimes just happen upon the limited Perennial releases, more often somewhere odd like a grocery store, than at the more serious beer shops where it moves faster. Find it on tap sometimes too. (I will add that Sump coffee, also where in town, is on par with the best I've had anywhere. I know the roaster there works closely with the breweries to ensure a good end result). I actually missed the opportunity for the Abraxas pickup party this year, which is a four pack for $100, including 2 Abraxas, 1 Coffee Abraxas, and 1 Vanilla, which was new last year and I haven't had. As an interesting experiment I picked up a 2013 Mikkeler To/From, their Christmas Ale (I think), for like $2 on closeout. I'm giving it 75% DOA, but sometimes those spiced holiday ales can be long lived. Even the TJ's, made by Unibrou, can go a few years. I'll probably start a bit early today for Arsenal - Liverpool. I'm unable to go to my preferred football pub, so I'll be pubbing it a bit at home instead. Not sure yet what's on deck. Agree on the Bourbon County. I usually drink them after about a year mellows them out just enough without turning them into bourbon milkshakes. Working my way through a growler of Born Yesterday. And.......did you buy said cans of Space Ways, this current batch is the last for this fantastic seasonal. Jellyfish Brewing in Georgetown Seattle opened their tap room today. They have been distributing for a year in the area and I've bought many pints of their different Sour Suzie versions before Sounders games. Today, I tried the Sour Suzie, Saison, imperial stout,, cerveza de los muertos and mole version, party on Garth sour red, and bbl fermented blonde. All good to excellent. I'd come back. Brought home some CdlM and Party on Garth to drink tomorrow. The space is open and good size, but no food. It's a few blocks off the cool main drag in Georgetown. Worth a visit if you're in the area, and close to Machine House, Lower Case, Georgetown Brewing (, and Elysian). Like a poor man's Rodenbach. Recently Had a Martchless bba sour brown with cherries with was a dead ringer for a Rodenbach. Tasty but wasn't what I was in the mood for. I used to drink a ton of this back in the day, but when I've revisited lately it comes off as rather sterile. Yeah. Not what I was looking for. Tasty, but nothing to write home about especially when I am such a fan of the Rodenbach Alexander. So hard to pass these up when you see them in the wild. That's because they're pasteurized prior to bottling now. Space Wars, while Duke pounds Kentucky. That's what I thought. Did they not used to be? That would explain a lot. I'd just assumed my tastes had matured since this was one of the first really sour beers (or seemed it at the time) that I had experienced. I remember liking it a lot when I first had it, though that must have been around 2010 if I had to guess. How is the regular Rodenbach red? I got two bottles today at $2.50 per 750.
https://embracethefunk.com/2012/06/26/l ... elgium-qa/ If you scroll halfway down to this link, it's basically a way to halt flavor development and reduce efficiencies on packaging side. There's also a great episode of goodbeerhunting with Lauren Salazar (head of sensory) at NB. *well* worth that price ... daaaamn!! A local retailer gets some ridiculous deals from time to time. I used to worry that the products were compromised but I've never had a bad bottle of beer or wine. Lots of Dressner wines closed out for $4 and that kind of thing. Was checking out with a four pack of a local brewery's stout yesterday and they had cases of the Rodenbach at 2 x 750's for $5 so I grabbed a pair. If I like it I'll buy more. Best part is they have two stores which are located in areas where more esoteric closeouts will sit for awhile and I can always go back if interested before it sells out.